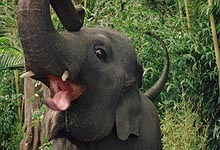 Download a Quicktime movie of Shep, the elephant that thinks he's a dog, from GEORGE OF THE JUNGLE. Visual effects by Dream Quest Images. Copyright 1997 Walt Disney. Nominated for two 1997 VFX HQ Awards: Best CG Character Animation and Special Achievement Award, Winner of Special Achievement Award. The live-action version of GEORGE OF THE JUNGLE makes its way to theatres, with terrific visual effects provided by Dream Quest Images. Dream Quest created a wide variety of effects for the film, creating a grand total of 60 effects shots. The film opens with many of DQI's matte paintings of Ape Mountain, many of which are flawlessly integrated into moving camera shots. Many more shots revolve around digitally manipulating live-action footage. DQI manipulated footage of elephants and lions to give the animals human-like facial expressions. In the elephant's case, DQI enhanced the animal's eyes by animating large CG eyes. Dream Quest provided some wonderful character animation pieces to GEORGE OF THE JUNGLE, animating both a fully CG elephant, as well as animating exaggerated expressions of actual elephants. But the pride and joy of the visual effects of GEORGE OF THE JUNGLE is the CG animation of Shep, the elephant that thinks he's a dog. In 15 marvelous shots, Dream Quest provided background plates with a fully computer generated elephant, including many shots that cut directly to actual footage of an elephant on-set. The CG elephant represents Dream Quest's finest CG character animation ever, and easily, one of the best displays of character animation this year. Shep is animated to perform a number of hilarious dog-like routines, including scurring to his master, chasing his tail, and jumping around like a mad dog. The single most amazing piece of animation is a binoculars-shot of Shep scratching behind his ear; another notable and memorable shot occurs as George and Ursula ride Shep into the jungle. The shot begins as Shep leaps over the camera and runs away from the camera, off into the distance. While the animation is stunning, the way the CG Shep was composited into its frames left something to be desired. In nearly every CG shot, Shep's edges are unnaturally soft, and some shots contain an excess of motion blur. A significant amount of bluescreen composites and wire-removals, completed by DQI, CIS Hollywood and D-Rez, rounded out the visual effects in this highly enjoyable children's film.